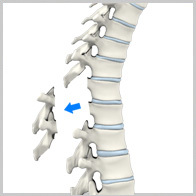 A surgical procedure known as a laminectomy (also known as decompression surgery) alleviates pressure in the back through the removal of the lamina; the portion of the vertebra that conceals the spinal canal. This surgical procedure actually widens the spinal canal to alleviate undue pressure against the spinal cord or nerves. A laminectomy is needed when a person is suffering from herniated spinal discs or bony spinal growths (often caused by arthritis). These conditions cause a great deal of pain and discomfort to millions who suffer from them each year. In addressing this or any other spinal condition, your doctor will first explore noninvasive, nonsurgical options with the patient; options that include physical therapy, injections, medications, and various back adjustment and massage therapies. In order to perform this procedure, the surgeon cuts an incision above the afflicted vertebrae and shifts the muscles away from the spinal column. The afflicted lamina is then removed, through the application of small surgical instruments. The incision is finally sealed with the use of staples or stitches. In the wake of this surgery and barring any complications, you should be able to return to work in several weeks. In the meantime, you are asked to limit strenuous and trying physical activities. A laminectomy is a fairly basic procedure that can–in many cases–result in a full return of comfort and mobility for the back pain patient. If you think that you might be in need of a laminectomy procedure, schedule a consultation today with Dr. Payam Moazzaz at New Era Spine.